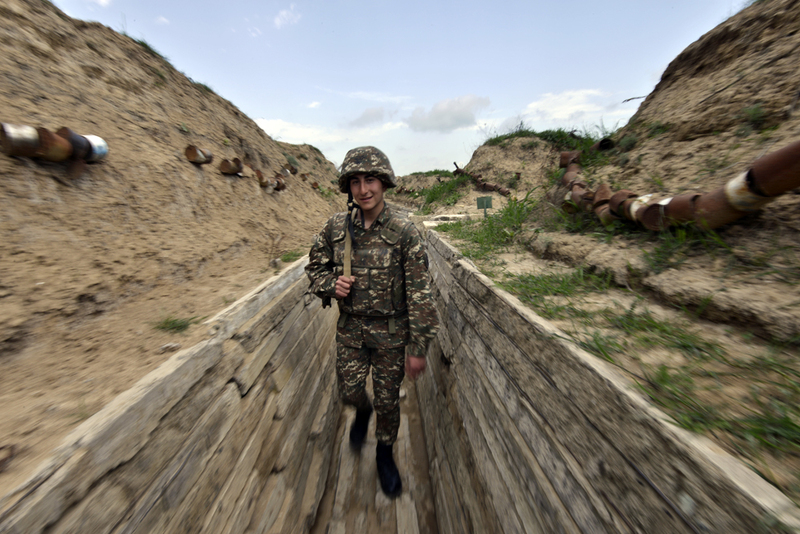 A serviceman in the area of the Nagorno-Karabakh conflict, April 7, 2016. Russian Deputy Foreign Minister Grigory Karasin, French Ambassador to Moscow Jean-Maurice Ripert, and OSCE Minsk Group's French Co-Chair Pierre Andrieu discussed preparations for a tripartite summit on settling the conflict over Nagorno-Karabakh in St. Petersburg. "The conversation addressed issues related to international efforts toward settling the crisis in Ukraine and preparations for a tripartite summit on the Nagorno-Karabakh settlement process in St. Petersburg," the Russian Foreign Ministry said in a statement available on its official website. "The situation in the South Caucasus and in Central Asia was touched upon," it said.